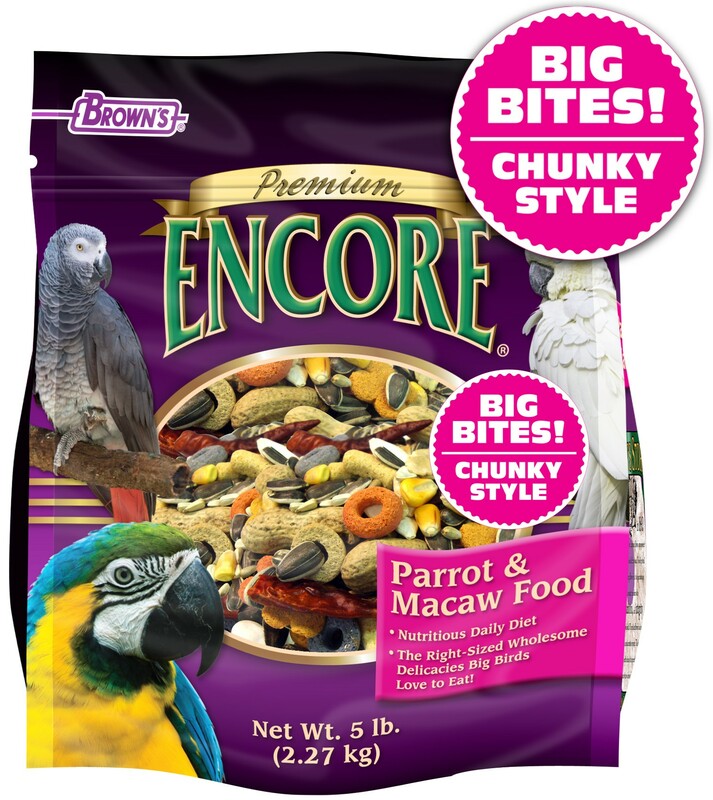 A vitamin-fortified food that is formulated to provide the proper nutrition your pet requires. 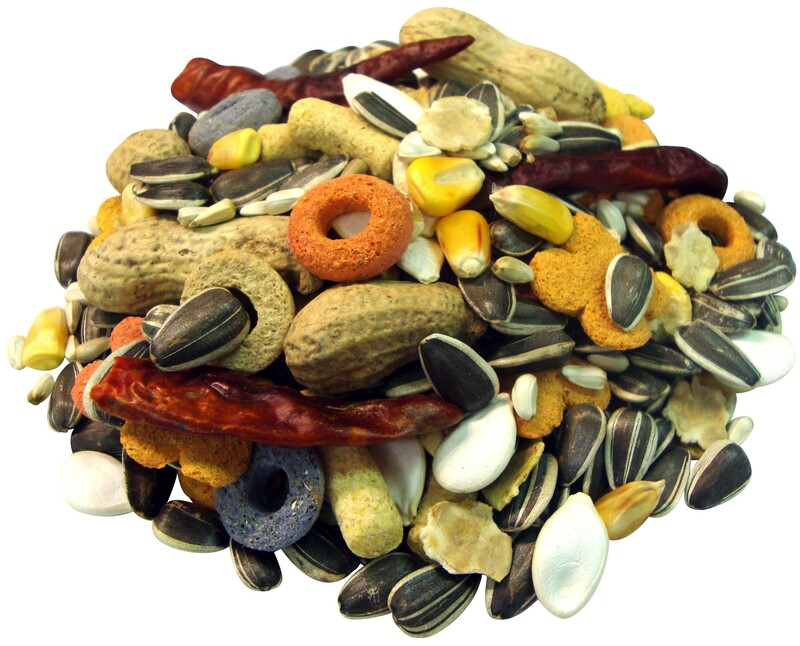 We've blended together the highest quality seeds and grains then topped them off with large pieces of chunky nuts, chewy fruits, wholesome veggies and extruded biscuits to make feeding time exciting, tasty, healthy and fun. Encore® Premium is a vitamin-fortified food that is formulated to provide the proper nutrition your pet requires. We've blended together the highest quality seeds and grains then topped them off with large pieces of chunky nuts, chewy fruits, wholesome veggies and extruded biscuits to make feeding time exciting, tasty, healthy and fun. 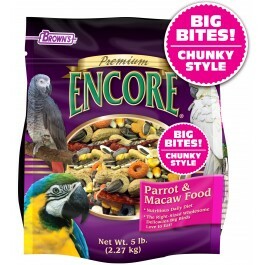 • Big Bites for Big Beaks! Stripe Sunflower Seeds, Safflower Seeds, Peanuts, Corn, Pumpkin Seeds, Flaked Corn, Flaked Peas, Dried Red Peppers, Wheat Flour, Ground Corn, Ground Oats, Corn Gluten Meal, Dehulled Soybean Meal, Soybean Oil (Preserved with Mixed Tocopherols), Dicalcium Phosphate, Brewers Dried Yeast, Calcium Carbonate, Fat Product (Source of DHA), Fructooligosaccharide, L-Lysine, Salt, Vitamin A Supplement, Vitamin D3 Supplement, Vitamin E Supplement, L-Ascorbyl-2-Polyphosphate (Source of Vitamin C), Thiamine Mononitrate, d-Calcium Pantothenate, Vitamin B12 Supplement, Riboflavin Supplement, Choline Chloride, Manganese Sulfate, Ferrous Sulfate, DL-Methionine, Zinc Sulfate, Sodium Selenite, Pediococcus acidilacticii Fermentation Product, Biotin, Folic Acid, Lecithin, Mixed Tocopherols (a preservative), Yucca Schidigera Extract, Rosemary Extract, Natural and Artificial Orange Flavor, Colors Added (Titanium Dioxide, Red 40, Blue 1, Yellow 5 and Yellow 6). Pediococcus acidilactii (min) 7,500,000 CFU/lb.